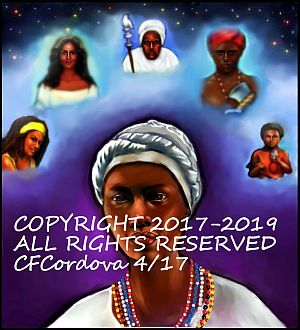 One of the orishas santeria spirits is called Oshun, also spelled Ochun or Oxum, has been syncretized with La Virgen de la Caridad del Cobre or Our Lady of Charity-see picture on the right. She is the Goddess of river waters, love, fertility, marriage, beauty, wealth, art and sensuality. Moreover, she is generous, kind, desirable, ambitious, seductive, self-centered and flirtatious. The abdominal area is sacred to Oshun. Those experiencing abdominal problems should seek out Oshun’s help. Women wishing to bear children reach out to Oshun for help. It is said that she grants the wishes of those who are deserving. 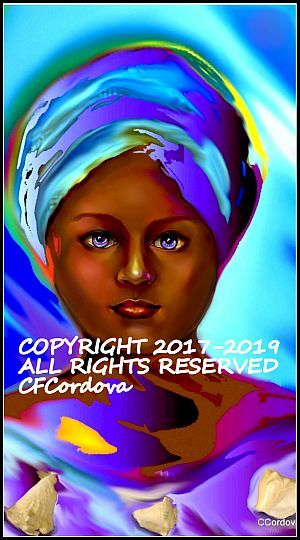 Oshun is the favorite wife of Chango and the younger sister of Yemaya (although some stories depict Yemaya as being her mother). According to folktales, Obatala is her father. Her feast day is September 8, color is yellow, day of the week is Saturday, and number is five. According to Luisah Teish, Jambalaya-the Natural Woman’s Book, Oshun is associated with a new crescent moon and Venus. 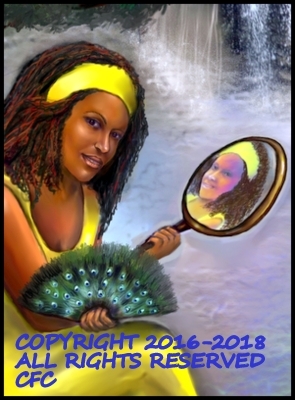 An altar dedicated to Oshun is more than likely to contain the following: a mirror, a fan, a piece of coral, gold, copper and a tortoiseshell comb. Offerings to Oshun, just to mention a few, consist of honey cakes, pumpkins and honey. In Santería, Yemaya has been syncretized with Our Lady of Regla- see picture on right. She is the mother of all living things, and has been around from the beginning of all creations. It is believed that all things emanate from her, including all the orishas. She is the Goddess of seawaters. She represents maternity and womanhood. She is generous, kind and beautiful. Her feast day is September 7, colors are blue, white and sometimes crystal, day of the week is Saturday, and number is seven. Planets associated with Yemaya are full moon and Neptune. 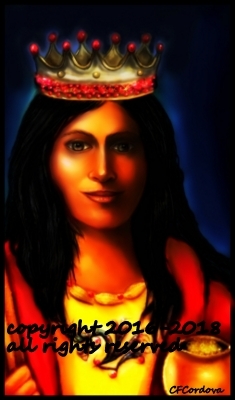 She is the adopted mother of Chango, and older sister of Oshun. 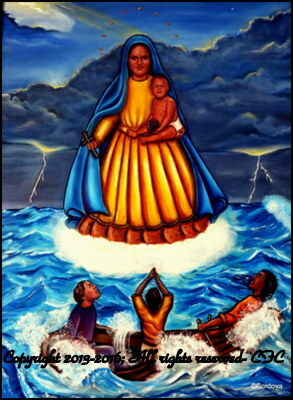 As mentioned above, she is sometimes depicted as Oshun's mother. Her favorite foods are watermelon, sugar cane syrup, and cornmeal. On New Year’s Eve, in Rio de Janeiro, Brazil, an innumerable amount of people, dressed in white, gather around Copacabana beach to pay homage to Yemaya. Offerings of flowers are thrown into the sea in hope that she will grant their requests for the upcoming year. 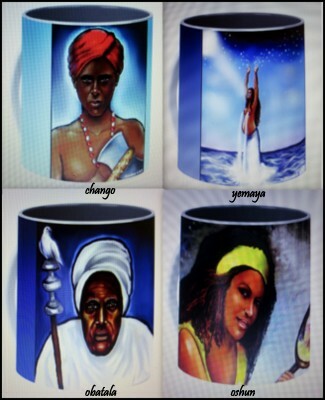 According to David St. Clair, Drum and Candle, Yemaya was the daughter of Obatala and Odudua- the black Adam and Eve. In addition to Yemaya, they had a son called Aganju. Yemaya and Aganju married each other and had a son called Orungan. As the son got older, his sexual feeling for his mother began to develop- similar to Freud’s Oedipus Complex. When the father was away, Orungan revealed his feelings to Yemaya. Shocked with Orungan’s revelation, she tried to run away. Unsuccessful in her attempt to escape, Orungan threw her on the ground and raped her. 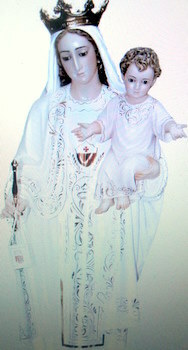 In Santeria, Obatala is associated with Our Lady of Mercy or Las Mercedes- see picture on the right. Obatala is the oldest of all orishas. 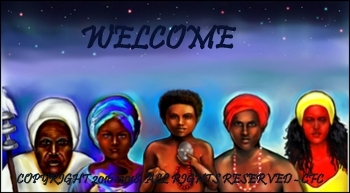 Legend states that God sent Obatala to the planet Earth to create life and govern all. He represents wisdom, peace, fatherhood, purity, generosity, sternness, and kindness. He is the King of the White Cloth. This is due to him being dressed in impeccable white clothes. He likes calmness, cleanliness and order. 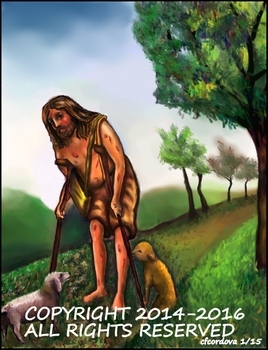 Although he loves his children, he demands respect and obedience. 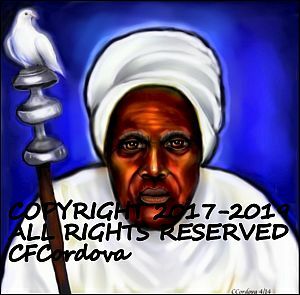 Migene Gonzalez-Wippler, in her book, Santeria- The Religion, states that Obatala is, “the father of mankind and the messenger of Olofi”(God). In addition, he controls all thoughts, and is the owner of all heads. According to Wikipedia, “Obatala is the creator of human bodies, which were brought to life by God’s breath.” He is the owner of all heads, and remains so until the person is initiated into the priesthood of a particular orisha. 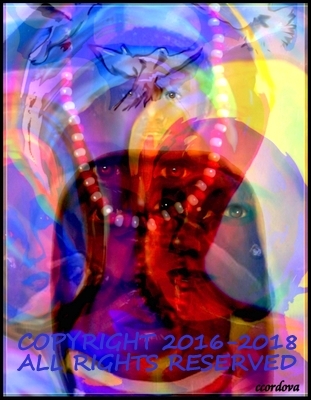 There are different aspects of Obatala in which he is seen as female as well as male. His feast day is September 24, color is white, day of the week is Sunday and number is eight. Planet associated with Obatala is Jupiter. One important feature connected to Obatala is a horsetail with a beaded handle. His favorite foods are pears and coconut. A recommendation from Luisah Teish concerning an altar for Obatala is to keep it in a high place. Worshippers of Obatala strive to live an unblemished lifestyle. 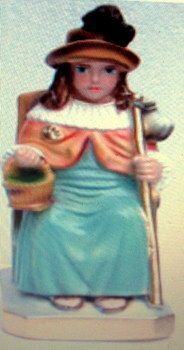 In Santeria, Chango is synonymous with the Catholic Saint called Saint Barbara- see picture on the right. Of all the african orisha deities, he is considered the most popular. He is affiliated with fire, thunder and lightning. He represents courage, physical strength, vigor, power and passion. Migene Gonzalez-Wippler depicts Chango as,"...an incorrigible woman chaser and a lover of food and dance." 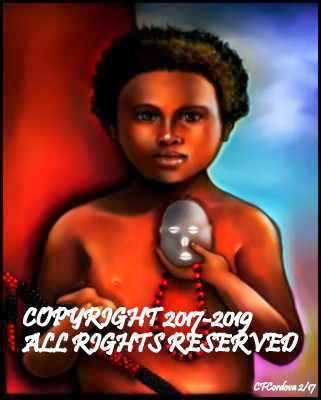 Chango is the son of Obatala, and the adopted son of Yemaya. He has three wives-Oba, Oshun and Oya. His feast day is December 4, colors are red and white, day of the week is Friday and number is six. Planets associated with Chango are the Sun and Mars. His favorite foods are apples, yams, corn, peppers and bananas. Sometimes, Ellegua is associated with Nino de Atocha because of childlike image. 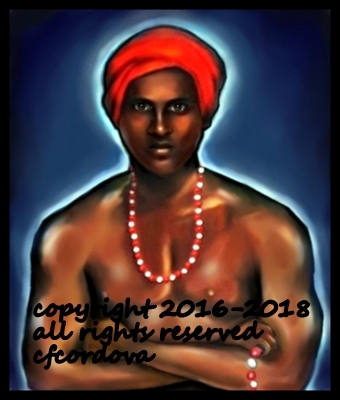 He is considered one of the most important Orisha in the Santeria religion. Ceremonies conducted in Santeria begin and end with Ellegua. He is the ruler of all crossroads. Ellegua symbol usually comes in the form of a cement head, a stone, a coconut or a seashell. Cowrie shells are used to denote the eyes, nose, mouth and sometime, the ears. His day of worship is Monday. Candles, sweets, rum and cigars are normally offered. His colors are red and black; number is three and planet is Mercury. 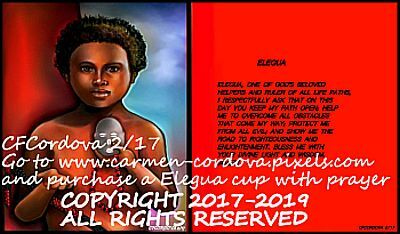 Click here www.carmen-cordova.pixels.com to view or purchase any of the painter's orishas artwork or coffee mug. Orishas santeria spirits - Babalu Aye. Coming soon.